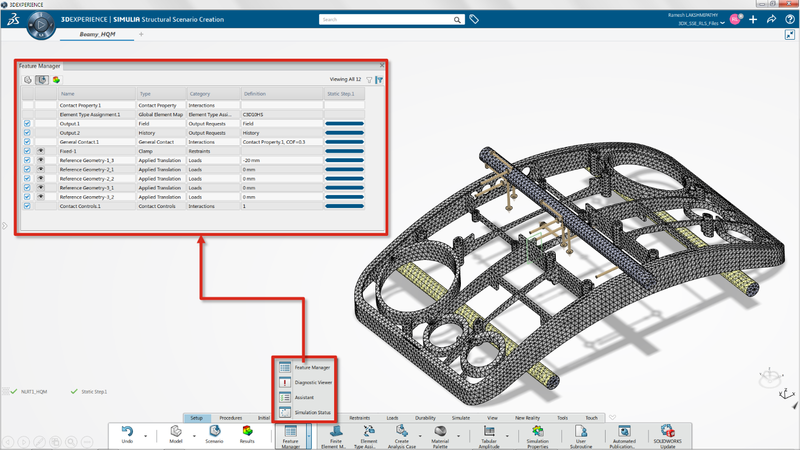 There has been a lot of buzz recently in the SOLIDWORKS community about SIMULIA Structural Simulation Engineer or SSE on the 3DEXPERIENCE platform. 3DEXPERIENCE platform is a business platform that provides software solutions for every organization in a company—from engineering to marketing to sales. It helps in the value creation process to create differentiating business experiences. Think about this as your smart device with all the apps on it. The platform works similarly. Below is a screenshot of the customized dashboard for my experiences! The 3DCompass is the circle of life with four quadrants each providing access to different types of Apps. The Apps area contains all the available products and services. The 3D Dashboard is where you can simply drag and drop different Apps to create your customized experience! I can even share my dashboard with a member(s) of the community for collaboration on a specific project. 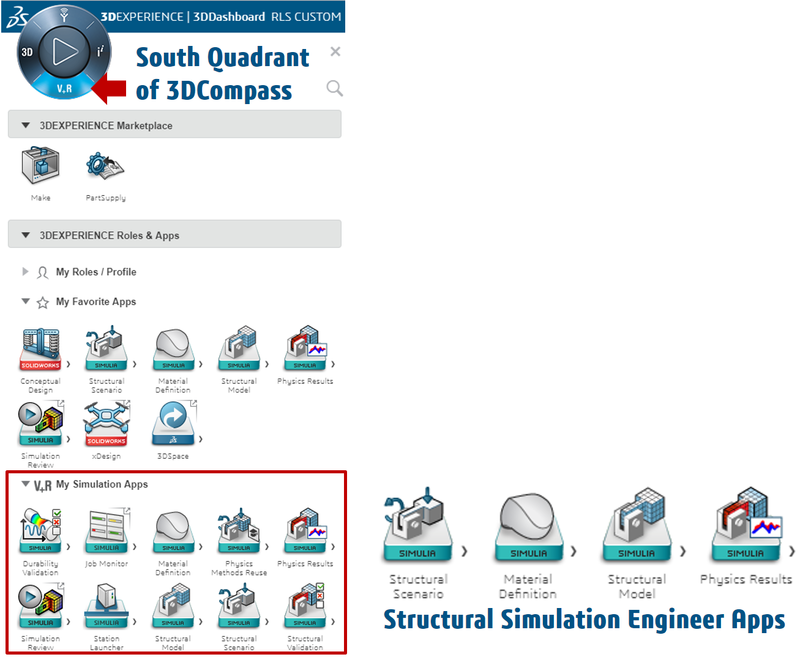 SIMULIA Structural Simulation Engineer (SSE) is a group of Apps on the 3DEXPERIENCE platform as shown below. There are several other simulation Apps available under the V+R My Simulation Apps section. I have always been an avid user of SOLIDWORKS Simulation Desktop to solve nonlinear problems, but there are times when I could not solve a specific problem due to software limitations or it just took hours to solve a critical benchmark. Clearly, I had two burning needs: to access advanced technology and to solve problems a lot faster. SOLIDWORKS Simulation is super easy to use as many of you know. 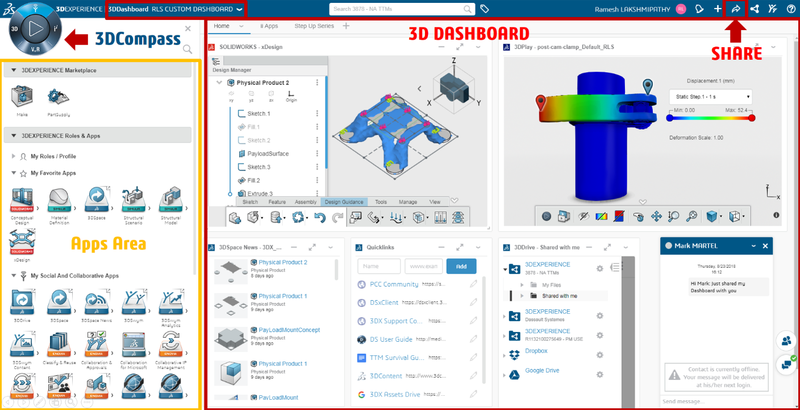 SSE is a natural extension since it integrates the workflow from SOLIDWORKS Desktop with Abaqus technology on the cloud-based 3DEXPERIENCE platform. The chassis frame model below is subjected to a three-point bending test in SOLIDWORKS Simulation Desktop using nonlinear analysis. This testing method is common in engineering applications to determine the flexural strength of the product. The concave side sits on two-cylinder rod supports and the convex side is pushed down through a third rod as shown. Material, Geometry and Contact nonlinearities are accounted to simulate this complex physics and account for a realistic behavior. The chassis material is Acrylic High Impact and it is assumed to be a bilinear material. This means that beyond the yield stress point, σY, the plastic region is modeled using a linear slope ET. The Elastic region is modeled using the young’s modulus or E.
SOLIDWORKS Simulation is easy and intuitive with the best user interface (UI) in the industry. Below is a snapshot of the setup. For this base analysis, lower order tetrahedral elements were used for a quick first pass results. The analysis results plots are as shown above. The maximum von Mises stress is about 51.2 MPa and the maximum displacement is 21.087 mm. The total solve time is approximately 19 minutes. The higher order elements resulted in a solution divergence so at this point I am ready to take this setup into Structural Simulation Engineer and verify two things: Can the problem run faster with more advanced technology and can the problem run to completion with higher order elements? And more importantly, can I seamlessly transfer my setup from SOLIDWORKS Simulation to Structural Simulation Engineer? 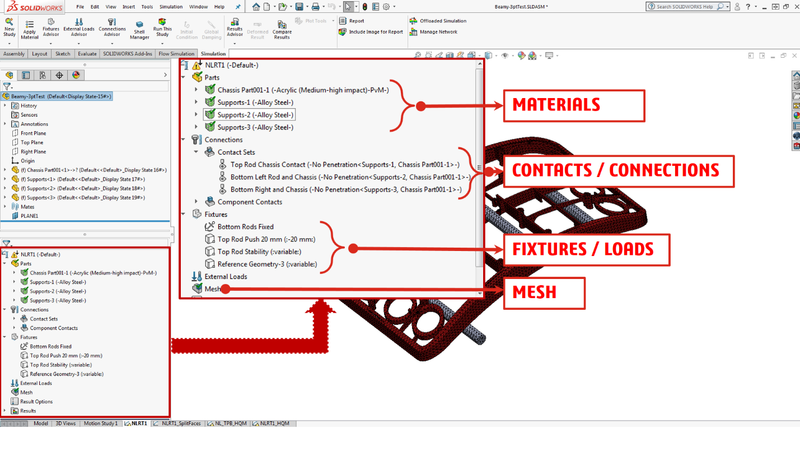 To connect from SOLIDWORKS Simulation to Structural Simulation Engineer, there are a couple of options. 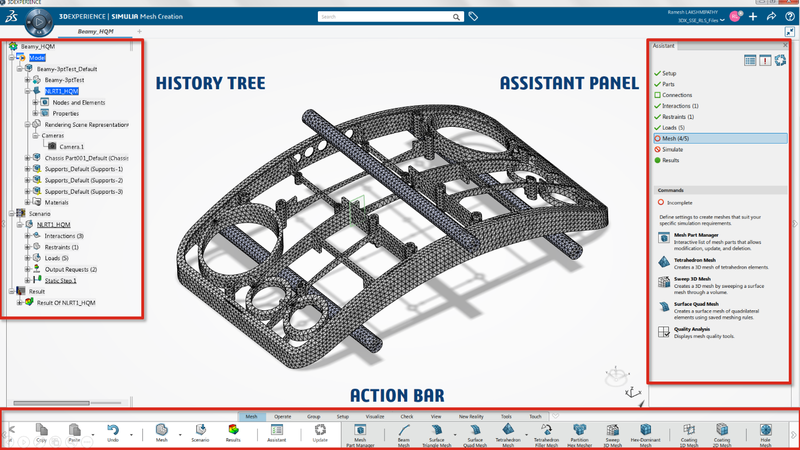 You can directly access the 3DEXPERIENCE platform from within SOLIDWORKS and then access the App using the add in “3DEXPERIENCE platform” in the SOLIDWORKS add-in window. In my case, I want to be able to transfer my nonlinear setup automatically without wasting time recreating my setup in Structural Simulation Engineer. So I will use the add in “3DEXPERIENCE Simulation Connector” as shown below. 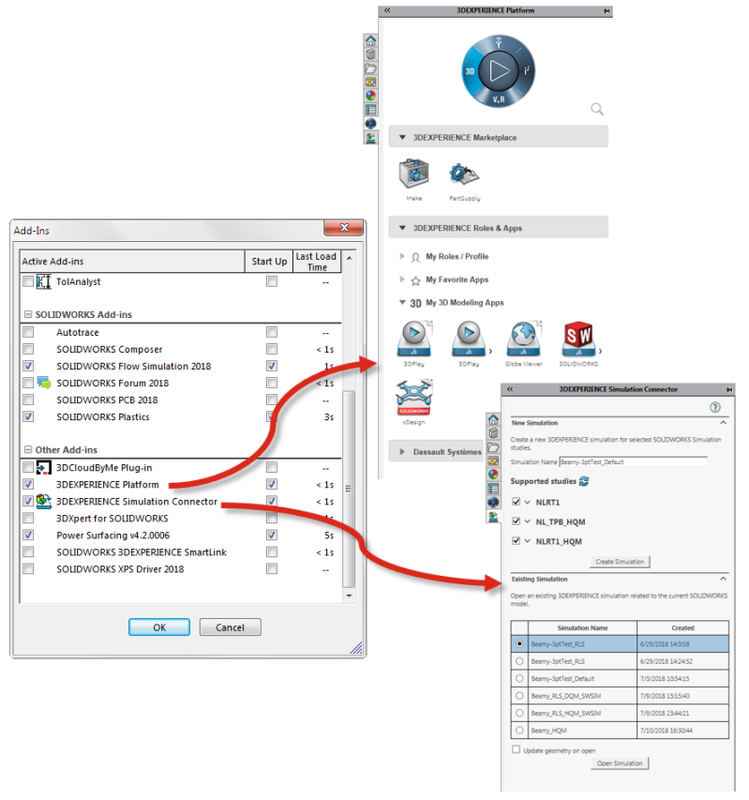 Upon checking the add in, the program smartly detects any linear static or nonlinear static setup in SOLIDWORKS Simulation and displays them in the task pane area as shown below. 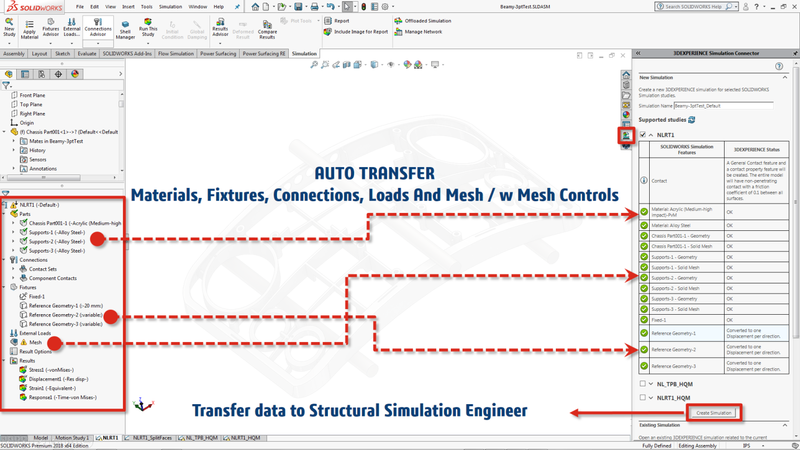 It then displays what items from the SOLIDWORKS Simulation setup are supported that will be transferred automatically to Structural Simulation Engineer. Pretty much every detail from materials, fixtures, connections, loads and mesh are mapped automatically. All that needs to be done is hit the “Create Simulation” at the bottom right. 3. Assistant Panel – This is probably the easiest way to interact with the simulation data. The Assistant panel is similar to the Simulation advisor in SOLIDWORKS Simulation, in that it provides the steps that guides you through every required component of the simulation. The Assistant panel is a great way to quickly familiarize with the user interface. The Feature Manager in Structural Simulation Engineer has a slightly different UI compared to SOLIDWORKS Simulation. However, the workflow to edit, hide, delete, include / exclude simulation features remains the same. So if I want to specify some advanced contact options, I can simply double click the “Contact Property 1” row as shown below and the corresponding dialog box opens up. The analysis time was only 7 minutes, roughly half the time it took in SOLIDWORKS Simulation. The maximum von Mises stress is about 45 MPa and the maximum displacement is 20.5 mm. While the displacement results are close enough in both products, the stress results show a softer response. This can be attributed to a more accurate load transfer in the contact regions and due to enhanced mesh and contact area conditioning techniques in Structural Simulation Engineer. Watch the video below from my colleague Reza Tabatabai for a more in-depth discussion on Structural Simulation Engineer. Originally posted in the SOLIDWORKS Blog.